In today’s world, we are inundated with unbelievable amounts of information. All day. Every day. News is on a 24-hour cycle and so are we. Some of us wake up, go to bed and spend much of the day checking in on social media. We can find out what almost everyone we know thinks about just about everything, and what they ate for their last 10 meals. Thanks to social media and geographically dispersed families, even many of our grandparents are enjoying aspects of our daily life thanks to Facebook, Marco Polo or other apps. With so much information available to us, how do we decide what’s important enough to save? Which memories do we preserve out of the approximately 25,000 images we may upload in our lifetimes? Smartphones and easy-to-use apps make photo taking and sharing simple. How can we decide what is important in all of that digital clutter? Why Do We Feel We Must Document Everything? When we were children, we had a few photos taken at important milestones like birthdays or holidays. They were printed and placed in photo albums. You know the ones with the adhesive pages that never stayed sticky and plastic sleeve that always fell off. Your parents may have shelves full of these albums somewhere in the house. Film and processing of images took time and were not as inexpensive as digital. Fast forward to 2018 where we have a smartphone practically connected to our hand. We take photos of practically everything our child does. Every playdate. Every cute thing. Every sad thing. Every milestone is documented with not a few photos, but hundreds. 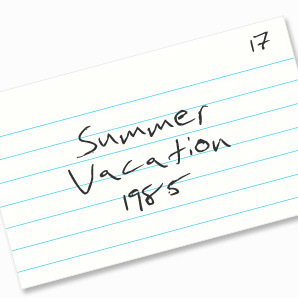 A vacation might result in a 1000 images. And all of the best ones are shared real-time to family and friends though social media and text. We chose our shots more carefully and only shot a couple of frames. Now we take a dozen of everything and think we’ll just choose the best and delete the rest later. But, does later ever honestly happen? How often do we sit down and go through 1000 images a month and pick the best ones? More likely, we load them from the phone to computer, external hard drive or web-based storage and forget about them. When we flip through those albums at our parent’s and grandparent’s houses, it’s wonderful to revisit those memories. How are our children going to know which photos are important or not? They certainly aren’t going to wade through a bunch of digital hard drives once we’re gone. 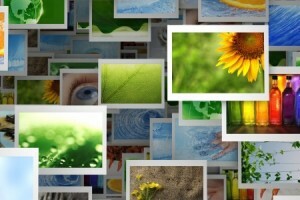 How Can We Preserve Memories in the Digital Clutter Age? What Can We Do to Save What Matters? Sometimes we need to put down the phone! Get one or two shots of whatever it is that you want to remember whether it’s an event or something adorable your child is doing and then put the phone down and actually experience it. Odds are those images are just going to be sitting on the hard drive anyway never to be seen again. Be present. This act alone will cut down on so much digital clutter. Schedule a routine time every month to clear out the digital files, reduce digital clutter and make sure the most important memories are preserved. Load your photos to your computer. Review each photo and video taken for the month. Create a folder for favorites and save one or two favorites from each month in that folder. Keep a favorites folder for each year. Print out each photo from your folder of favorites at least annually. Alternatively, a digital album for each year can be created and printed from your folder of favorites. Many photo sharing sites create books automatically for you. Save all digital files on your chosen backup storage method (external hard drive, web-based storage, etc). The holidays are also a great time to revisit those old albums at your parent’s and grandparent’s houses and the perfect time to take those printed images and digitize them. Using a bulk scanning service like https://www.scanmyphotos.com/ can save tons of time and make sure those memories last forever. More news on digitizing photos was just published by Utah’s Deseret News. Goldstone’s company has digitized more than 600 million pictures since it started in 1990 and was recently mentioned in the The Washington Post and on Oprahmag.com as a recommended source for scanning photos. Welcome. 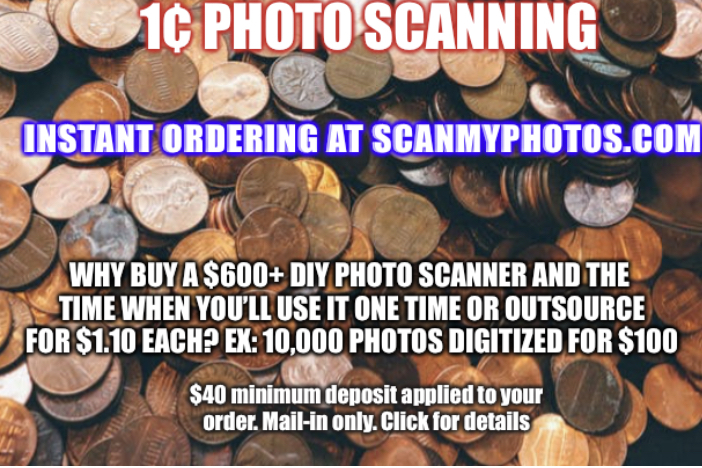 Why spend hundreds for a DIY Scanner, the time spent or from outsourcing for upwards of a dollar each to scan your pictures? 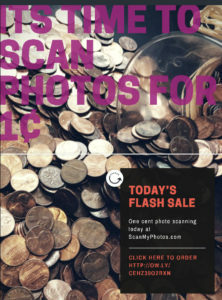 ScanMyPhotos just launched this new one cent photo scanning service with you in mind, especially for very large orders. In our 29-years in business, we never offered anything like this. But, we never scored a recommendation by Oprah either, until now. The Oprah Magazine recommendation led to hundreds of calls. Readers explained they had thousands of pictures to scan and wondered if there was a less pricey solution? Heck, we already were priced way below anyone else. But, we listened. We wanted to do something game-changing special for Oprah’s millions of readers …. and for you. Nearly 3,200 people took advantage of this first-time-ever discount to scan all their pre-digital photos. Why? There were the Oprah recommendation and all these news and review profiles. But, also because of the destruction by hurricanes and wildfires. These natural disasters have taken a toll on family photos. We even heard from a past customer from years ago. She asked if we still had the thousands of pictures digitized for her? Sadly, she explained her house just burned down — the digital files were stored alongside her pictures. Not backed up off-site. You know our passion to preserve photos. Daily stories like these are so emotional that we wanted to help inspire you to have your pictures scanned. PLEASE share with many. As reported by this past Weather Channel story, this keeps happening. This is your access to our first-time-ever special event. Your cost is just one penny for each standard “Social Media” 150 DPI photographic picture digitized with the “Pay-Per-Scan” photo scanning service. Minimum order of $40 which is applied to your order, excluding return S/H, which you pay. Non-refundable and no refund for unused balance. All photo preparation rules apply and are limited to 10,000 per person/order/address. Please review the following details and terms. $40 order minimum is charged when ordering and credited towards your order total, but not applied towards return S/H charges. Non-refundable. No refund for unused credit. Example: 1-4000 pictures scanned at 150 DPI is $40, 10,000 pictures scanned at 150 DPI will cost $100, plus any add-on services you select. More Add-On Ordering Options Are Available For Your Photo Scanning Project. Because we have been fielding many inquiries about how to enhance the orders with the popular featured additions, here is a list with prices to complement your order. CLICK HERE: We recommend you take advantage of several of the other add-on featured services to enhance your photo scanning project. Please use this link to share with others so they too can enjoy this special one-time-only discount to digitize and protect all their photos. Remind all that the discount code will expire and disappear without notice. 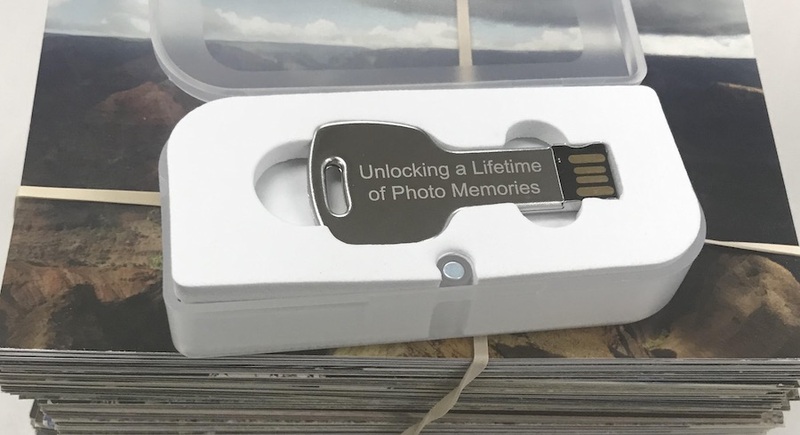 The gang here at ScanMyPhotos takes digital storage and backing up best practices very seriously—especially when it comes to the irreplaceable sentimental value of your photos and film. While we have professionally digitized 600 million pictures (this fast), there are still trillions more to preserve and backup. Take a few minutes on this day, check and see if all the photos in your smartphone are being backed up to a cloud service such as Google, Dropbox or iCloud. Oh, and back up important docs, too. Many people do not own scanners to store physical images. 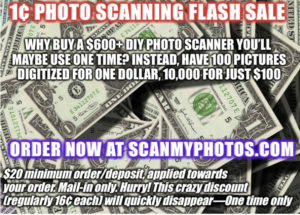 A good way to scan and store them can be found at ScanMyPhotos.com, which will scan and store online photos, slides, negative and videos and has been doing it since 1990. For #WorldBackupDay pay just one cent each to have your pre-digital pictures scanned. 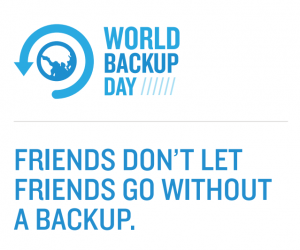 So, if you don’t want to lose any memories, data, important files and pictures take the #WorldBackupDay pledge and share it with your friends on Facebook and Twitter. But let’s not stop with just one day either! This day should serve as a ribbon around your finger—a reminder that we should be backing up our precious data on a regular basis throughout the year.